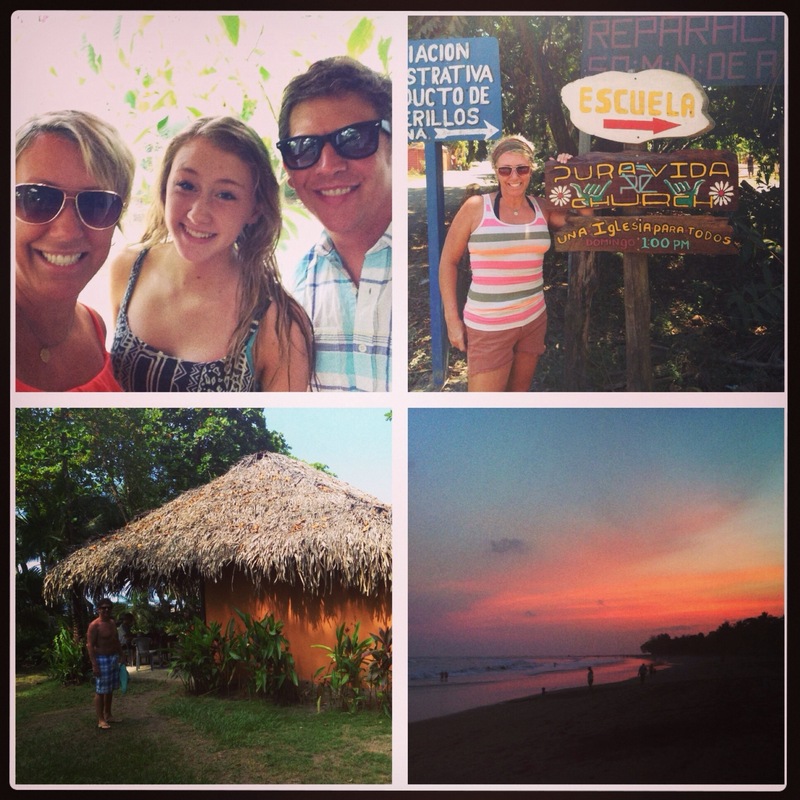 Our last week in CR was a whirlwind of crazy adventure. After I had a one-day cold (seriously! I love Costa Rican colds MUCH better than colds here in the US) we decided that we were going to take off to one of the last places in this amazing country that we haven’t visited. Tamarindo!! Like every driving trip we have taken in the country, it was a total crap-shoot on directions. I hopped onto my IPad, and mapped out our route. I knew once we left the house, and we didn’t have internet that the screen shot I had taken would be the only map we would have! On one map, the driving directions said it would take 2.5 hours (hmmm) and the other map (on the same route) said 4 hours. (Bingo!) We packed up a few things and got up early to take off! Surprisingly, the whole drive except, the last 20K were all paved and on a great highway. We were a bit concerned that the actual route listed the start of this drive as a “unknown road!” But like several times in Costa Rica and the many other places we have traveled, we know that the road less- traveled or “unknown” always seem to turn out the best! 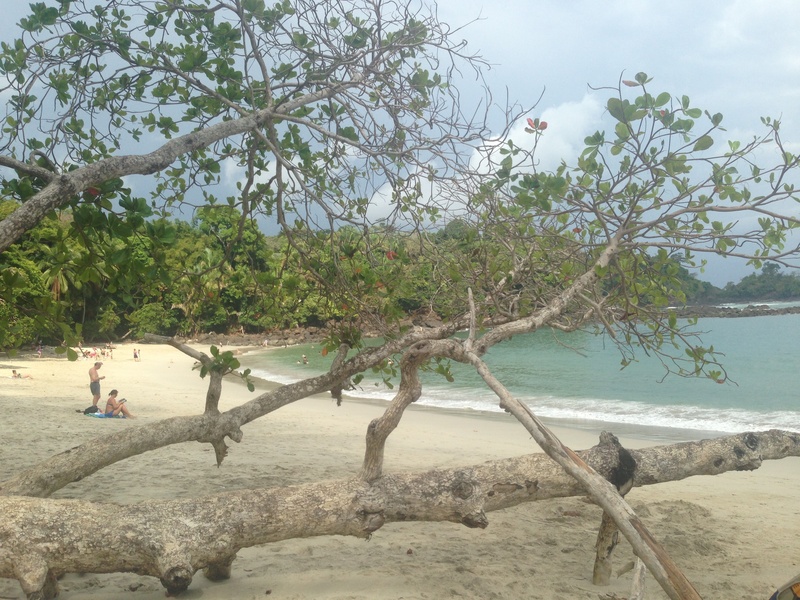 We arrived in the highly bustling and active town of Tamarindo and fell in love immediately. It was a sweet little, surf town, situated along a gorgeous coast line. There were fun little shops, and tons of restaurants. Definitely an excellent food town. We strolled the streets, did some shopping and found a great little spot for some Happy Hour, and then set out to walk the beach. It is amazing to me, the different beaches in this country. From one ocean, on one coastline, such diversity in the sand. White and powdery, course, cocoa brown, latte brown, black…you name it! 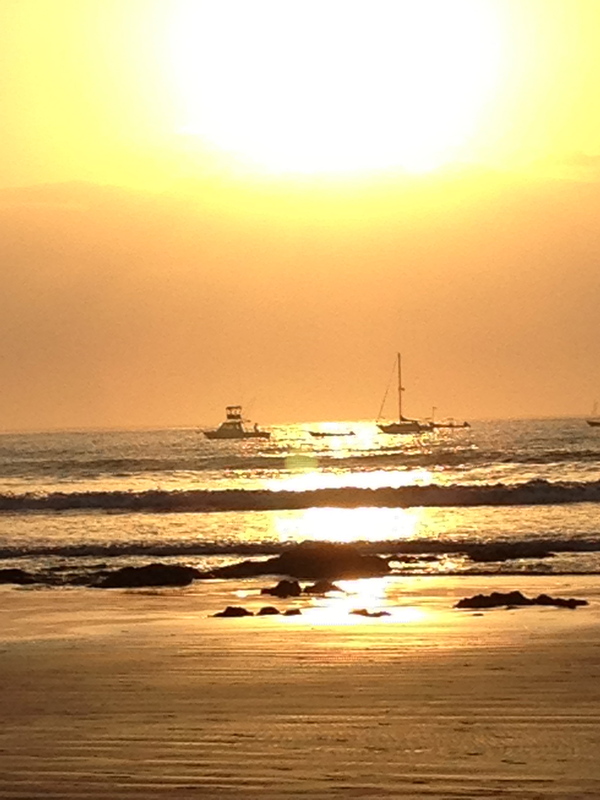 Tamarindo has fine, fawn-colored sand. With miles of beach. I always love a town that stops for their sunsets. Everyone! I loved watching the surfers and paddle boarders in the water, stop to watch with devoted affection, the incredible, fire-red, sun dip its way in to the Pacific Ocean. It’s an experience you cannot miss on any day. And why would you want to? 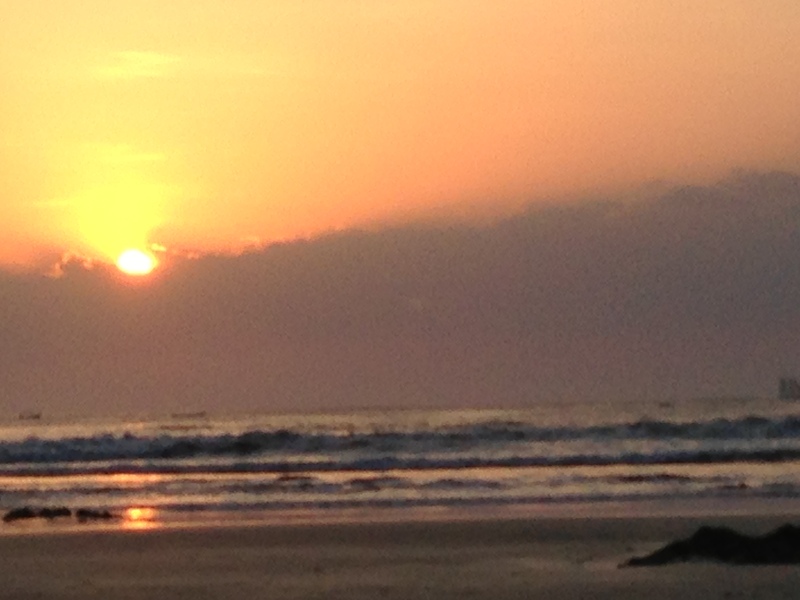 Even the restaurant staff wandered out onto the beach to watch the unimaginable beauty of that moment! Perfection! Stop, pause, and see God’s beauty. 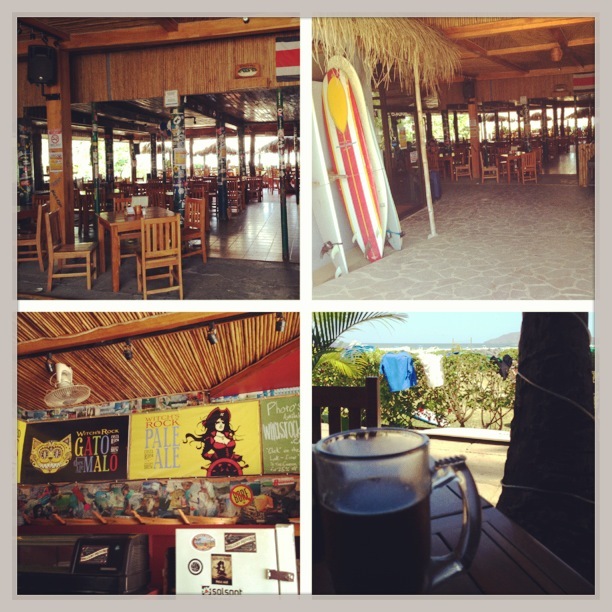 Had to get a Volcano Brewing Co beer before we left Tamarindo. After coming back to Esterillos Oeste, we decided that the rest of our week would involve zip-lining and surfing as much as we could. 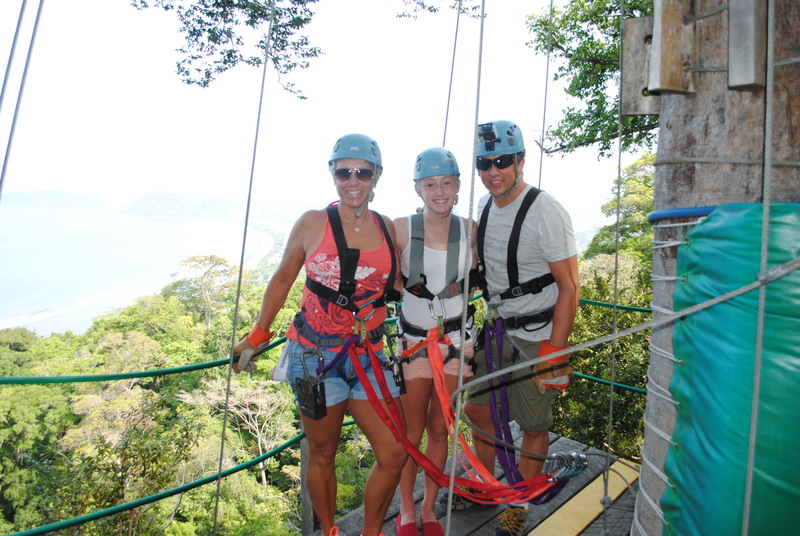 We have zip-lined in CR before, down in Quepos, but we wanted to try a different outfit. 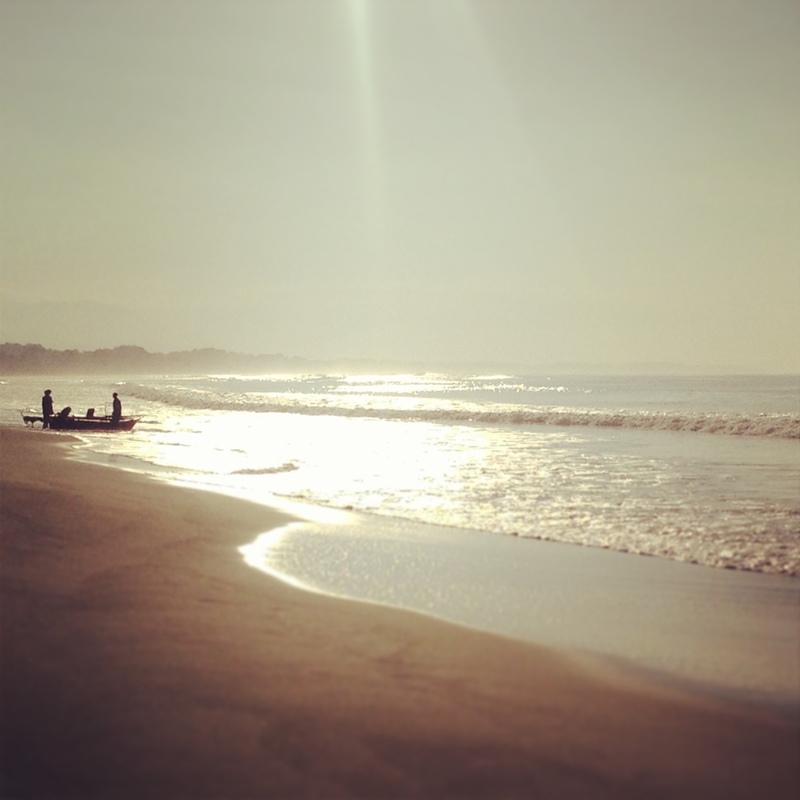 We found a place in Jaco that offered “non-beginner” lines….that’s all we needed to hear! We set that up an for the next day and set out to find some waves. Alli decided on a different board for the day, wanting a little challenge. I have no intention of giving up the long board, but Alli was ready for a nice, short, sporty board. Of course, she picked it right up. I swear I would love to see this girl if she could find waves everyday. She’s a natural. Greg decided he was going to give the shorter board a go. I had just come out of the water, and was on the beach, watching what I thought was going to be an epically funny cartoon about to play out in front of me. Greg paddled out, and tried to catch a nice little white wave….and down he went. He turned to paddle back out and then abruptly turned back and started in towards the beach. I sat, wondering if he was hurt. It didn’t look as if, he was rolled too badly by the wave. But what you see from the beach is drastically changed when you are in front of a wave. What I wasn’t expecting was for him to come up on the beach grabbing his foot with a jellyfish sting. OUCH!! The funny thing was that just an hour before a local guy had warned us to “be careful out there” because there were lots of jellyfish out there on this particular day. Greg sat grabbing at his foot, in complete disbelief of this happening. What were the odds? We assessed his pain, which was severe, and the odd little bleeding “whip” across his foot, and called Alli in so we could get over to the Mas x Menos for vinegar. I am still in complete awe, that this happened. As the three of us talked about it, driving to the grocery store, we kind of feel that its sort of like a lightening strike….which has ALSO happened to this family (that’s another story) (maybe we need to buy a lottery ticket sometime!) I ran into the store and came out and doused his foot in vinegar, which set him off to hopping around for a few more minutes, and then, just like magic, the pain was gone! We decided that we better get fish tacos after that harrowing afternoon. Any excuse for fish tacos, right!! 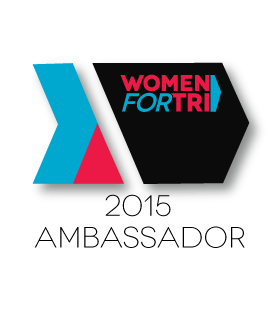 And really…we don’t need an excuse! One of those unforgettable Father/Daughter moments, that I want to burn into my mind! The next morning, we had an early reservation for zip lining. We got into the shuttle with just 2 other girls that were in CR from Texas. Jackpot! 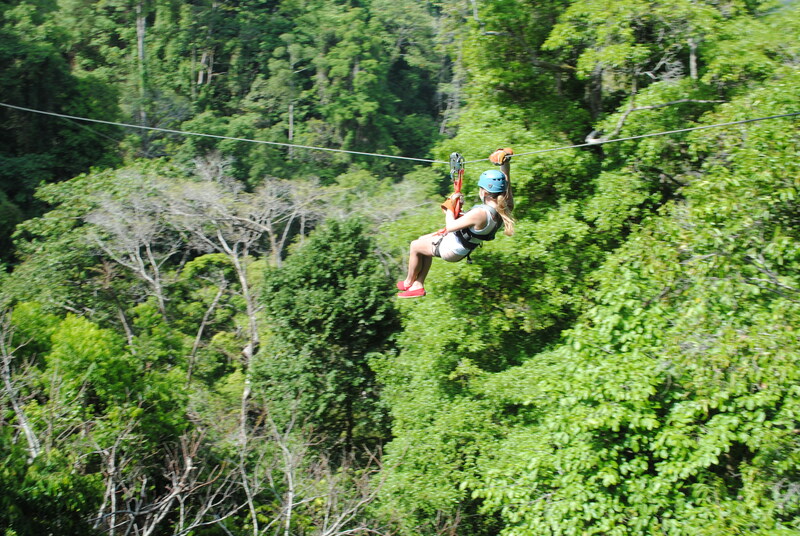 Always hard to zip line when there is a huge group. 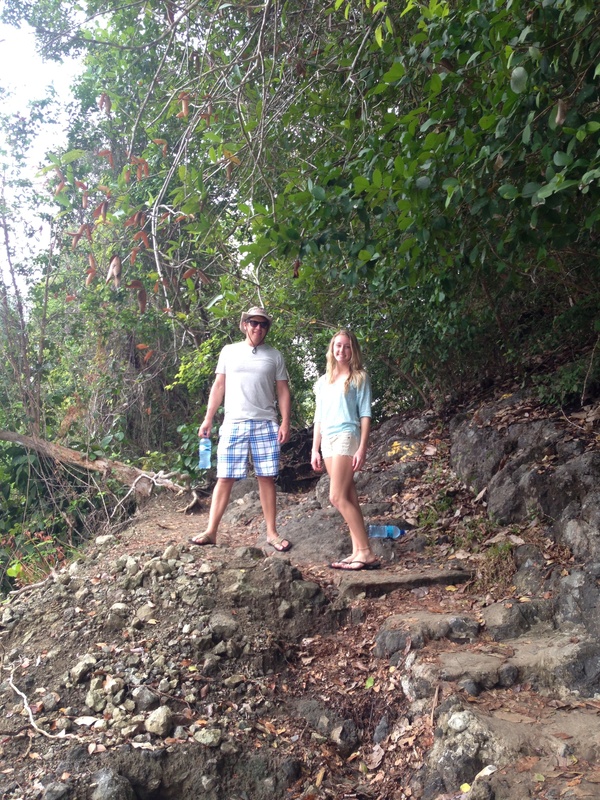 We shuttled up a huge, winding, mountain outside of Jaco, then after a little uphill hike and about 50 stairs (great workout) we arrived at our first line. 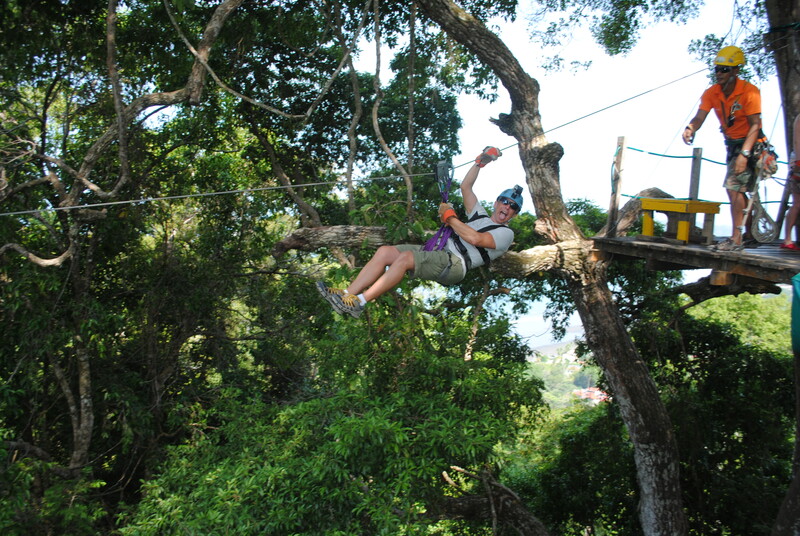 Being in the jungle of Costa Rica is always so exciting, with or without a zip line. 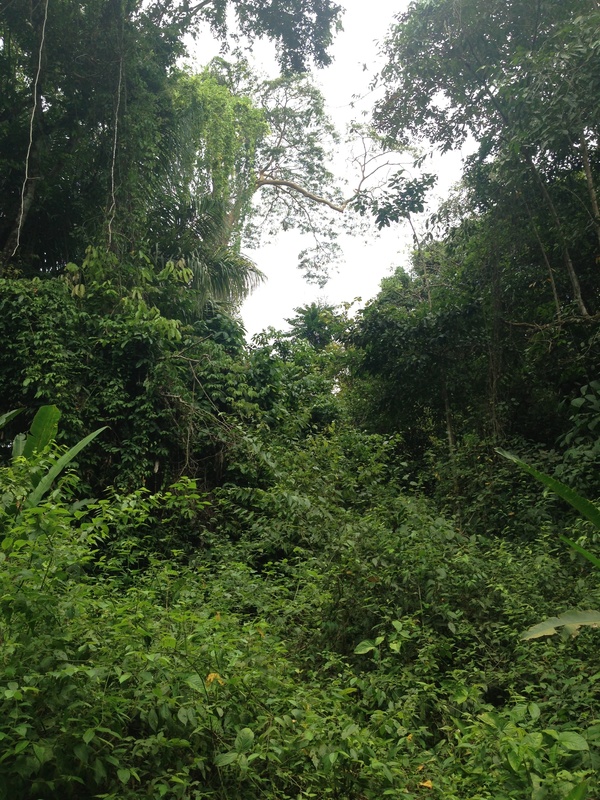 The lush, thick, jungle is always teaming with all sorts of sounds, and animals. 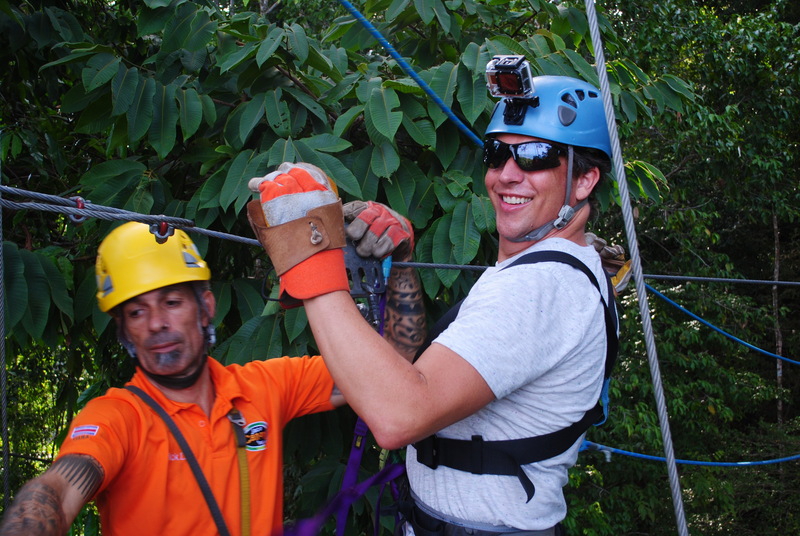 This was by far the best zip-lining we have done. They said, that it was not for beginners, and it didn’t disappoint. LONG, long, lines that were so fast. 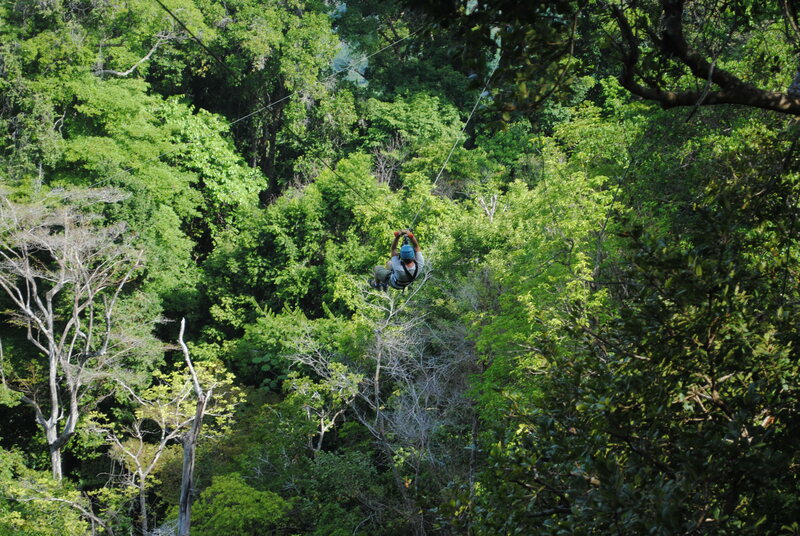 There is something about zipping above the trees, 600-some feet above the jungle, like monkeys, which we did see, of course!! 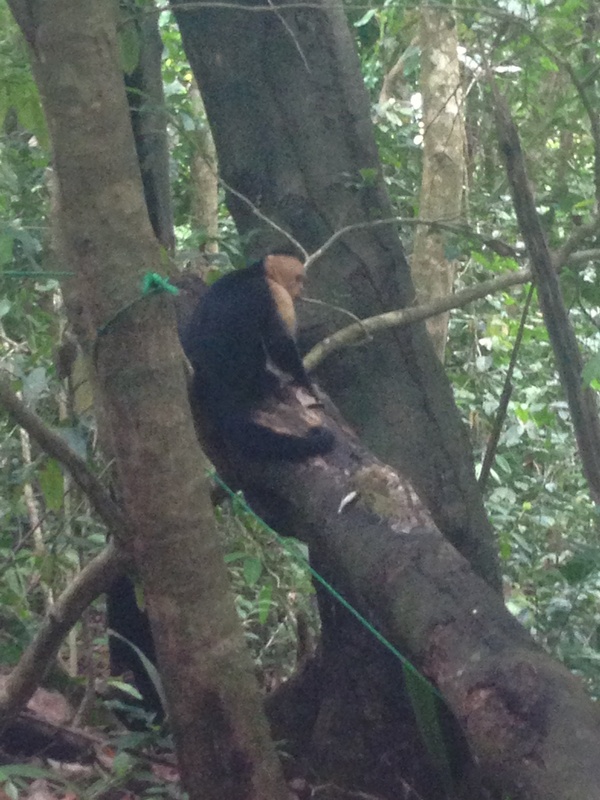 Lots of these little monkeys swinging in the trees watching us zip-line. Leaving CR is always a test of our heart. We are never quite ready to say goodbye, no matter how long we stay. We are all salt-water junkies, sun devotees, and adore the people, the food, and the peacefulness of this special place. Every time we leave, it’s like we leave a piece of ourselves there. But at the same time, we bring a piece of CR home with us. I am thankful for every experience we have there, and feel blessed for the provision of being able to travel there with our family every year. This is the place, we regroup, reevaluate, reorganize, prioritize, gain perspective on life, renew, refresh, and gain a whole lot of knowledge on what and who are really important in our lives. 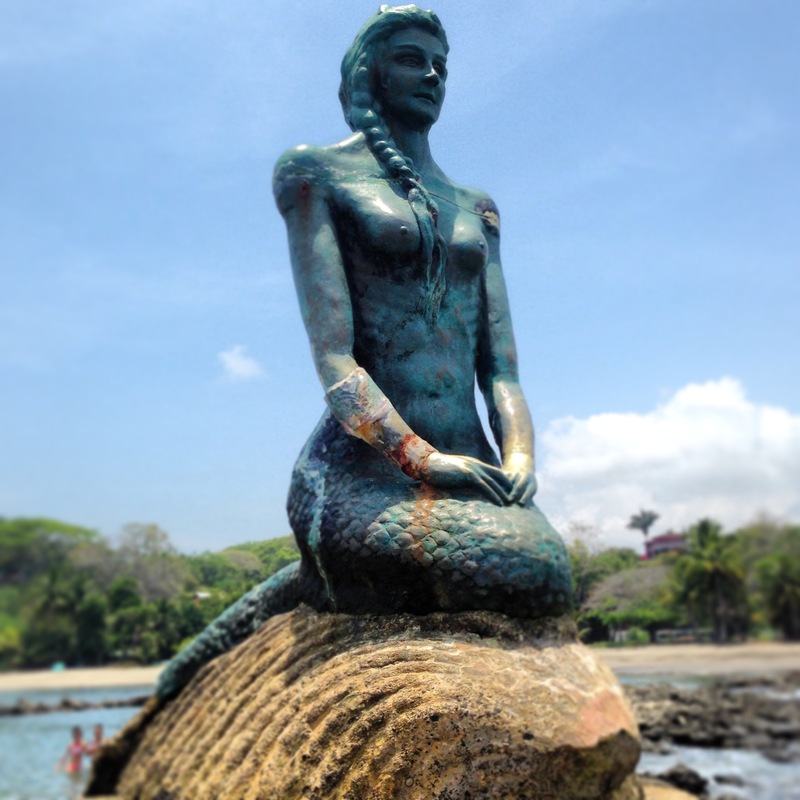 La Sirena watching over the Pacific in Esterillos Oeste. He’s not having ANY fun, is he?? Week two is always by far the best week while we are here. 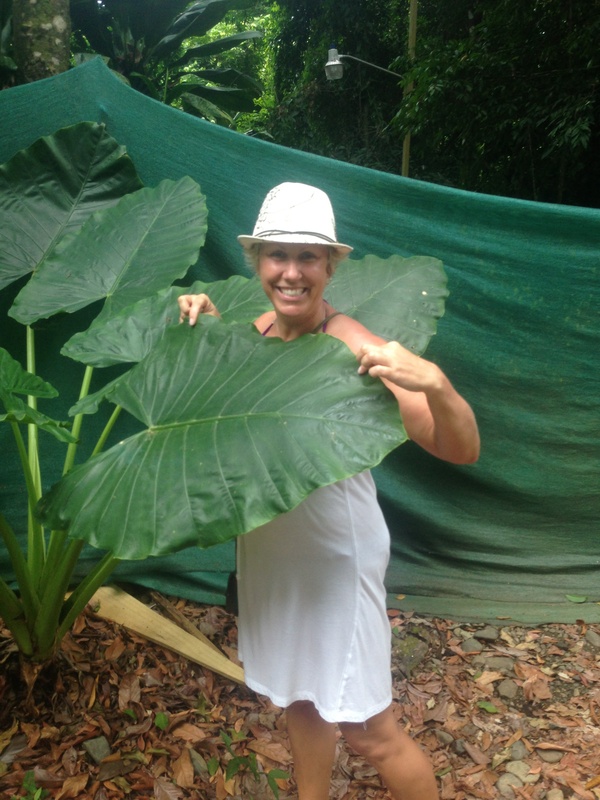 We’ve settled in, we’ve slowed W A Y down, and really gotten into the flow of being in Costa Rica. We have spent a large part of this week surfing. Mainly in Jacó. Nice, soft, rideable waves that won’t kick your a$$ too badly. Most days. As I surf more and more it teaches me so much patience. You cannot rush anything out there. It is a total love/hate relationship for me. You work so hard, paddle, paddle, paddle, out and wait. And wait. And….wait. Patience. The times that I rush, I always regret it because the ocean is all too quick to give me a “smack down.” And oftentimes, quite notably. But then it happens. Your patience gets rewarded. You are blessed by a perfect, beautiful wave, and all is right with the world…anything too soon, would’ve ended in a completely different ride. It reminds me, that rushing anything, ruins the experience, entirely. And that only through patience, do we get the spectacular and extraordinary. We have hit quite a few beaches while here. One day at Playa Blanca. This little cove is beautiful. Crystal, blue,water, and a pristine, white beach. It’s a tanning beach. No waves but great swimming. This was where I donned my swim goggles and went for a actual swim. A training swim. The entire day, it was us, and 3 other people on the entire beach. Total seclusion! 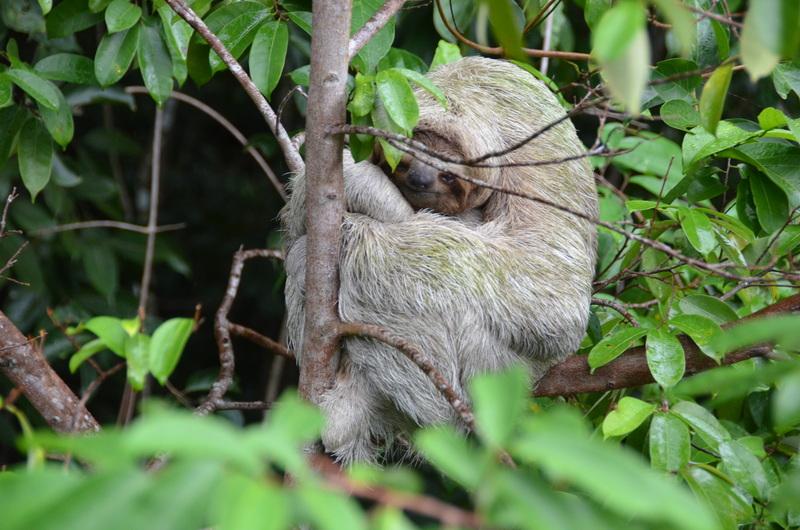 We spent a day south in Manuel Antonio. 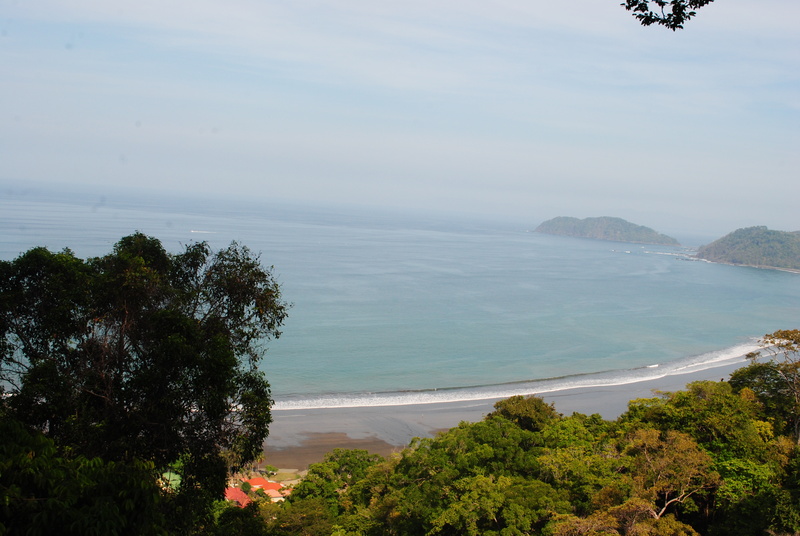 We’ve been down there several times, but its a fun place to hang out, catch some sun and do some hiking in the rain forest. On this particular day, we saw, turtles, and two different types of monkeys. 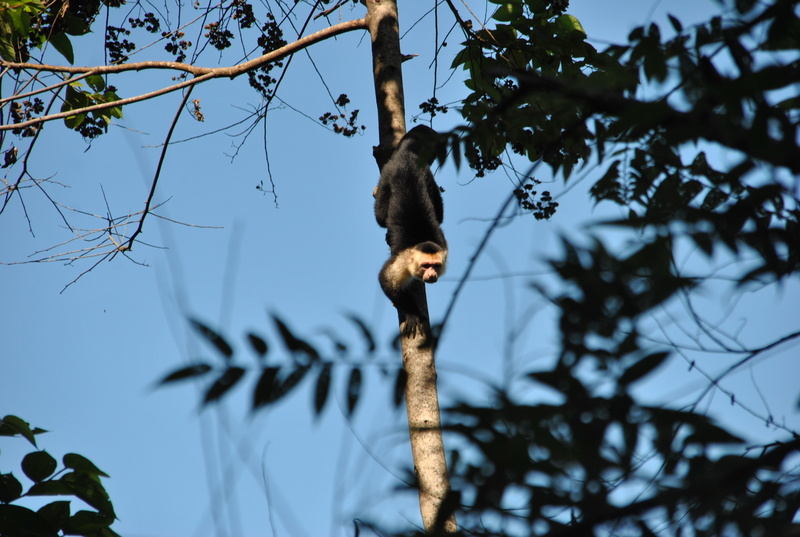 White-faced Capuchin and squirrel monkeys. 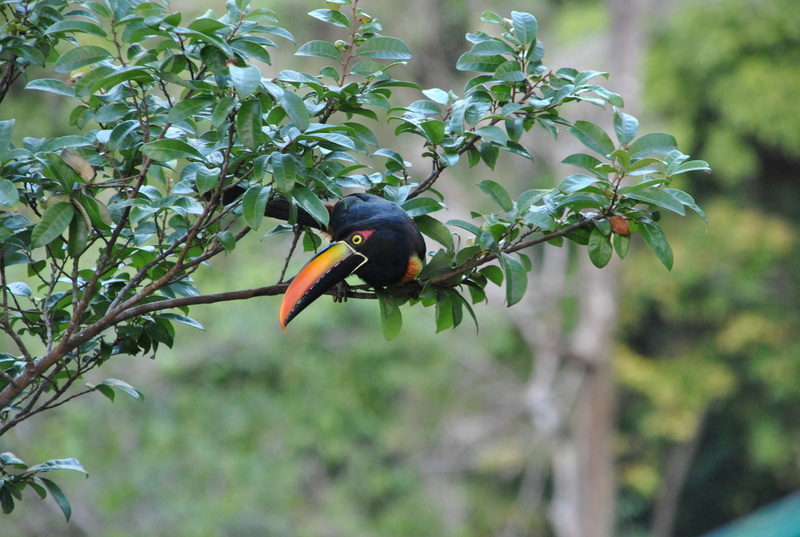 It’s always fun while hiking to see these little guys playing in the trees (they are all over the rainforest) You hear one, then you can hear the whole neighborhood coming! Swinging from tree to tree. We watched them for a long time, and then off they went. We also spotted a couple of wayward raccoons, or maybe they spotted us….and our lunch. M.A is a great little town with lots to see and do, and some pretty good restaurants. Even though this is probably our tenth time down there, it never gets old. 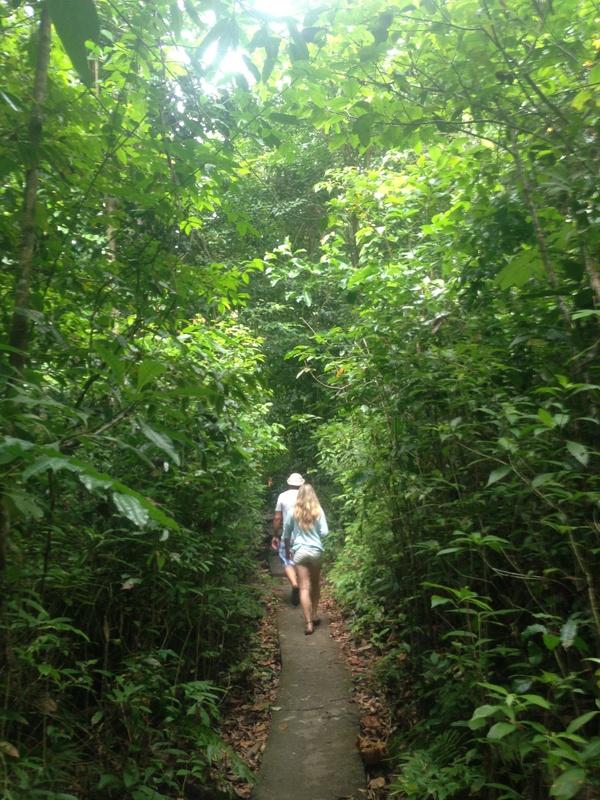 Trekking through in search of monkeys. We had one night at home that we were without power, briefly. As we went about with our flashlights finding candles, we couldn’t help but hear this scratching sound. Now on a side note….noises here are just a way of life. At any second you can hear 30 different noises. 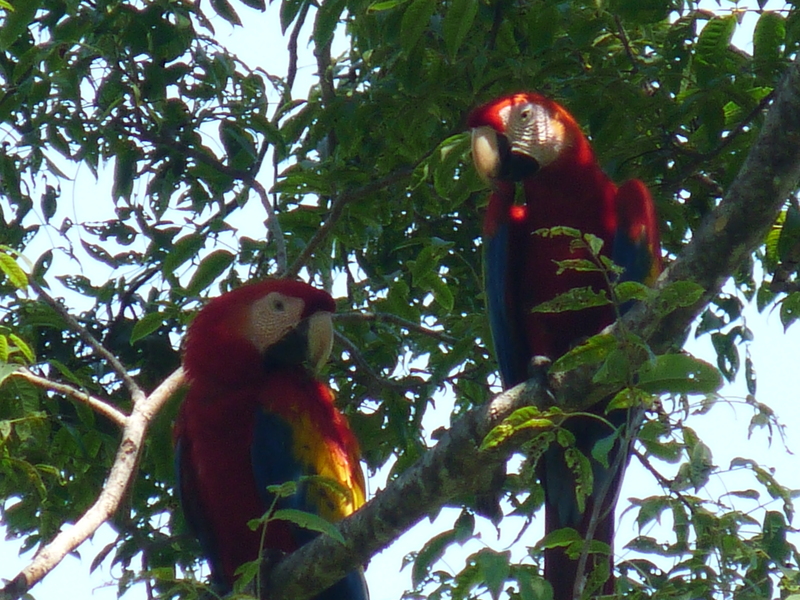 Scarlet macaws, geckos, roosters, dogs, waves, wind, sirens, little cockatiel birds…you name it. But this was a scratch, scratch and then nothing. Then again, scratch scratch and then nothing. We figured some sort of bug had made its way in. Another side note…bugs….a way of life here. And my gosh, they are some of the most interesting bugs, ever. So we took flashlights to go in search of the source. Evidently a crab had decided to make our casa, his casa. And not the tiny hermit crabs that race all over the beaches here, this was an actual crab…..much bigger and he may have NOT been shown the door, but a nice pot of water. I am still running the beach early, every morning. Soaking this all in. This is always when I have my best prayer time. Anytime I run alone, there is that intimate time with God. I run out, always to beach left, and head towards Esterillos Centro and Este. I watch my feet hitting the sand, leaving my footprints as I run forward. As I leave them, I leave behind, something I need to let go of. Something weighting me down perhaps. Something I need forgiveness for. Sometimes its something that has been stuck, that’s needs to be let go. I leave behind bad attitudes, bad thoughts, negativity, and anything weighing me down. I pray down the beach, leaving each and every piece of me, that needs let go of. And when I return, just like that! the footprints are gone. Washed away by the ocean tide. I have laid down the negative and God has taken it all away. I am able to pick up the positive on the way back. The answers I have been praying for. The questions I have given up to God. They are there, waiting, for my return. It makes me so thankful to see those footprints washed away, and feel so much lighter on the way back. This is also when I pray for my family and friends. Email messages that I have received. The fun Skype calls I have had. They all get lifted up. I love how knowing that just as the tide has washed away my footprints, God has washed all of the ugliness out of my life. And I’m brand new. Just like the miles of pristine sand ahead of me. I am so thankful for that, and that God is so merciful to me. I have had some pretty specific things answered for me on this trip. I’ve asked God for very clear direction, and opened and closed doors, and He gave me just that! Wow! What a story! What an adventure! What a God!! If we were ever stranded here, I am making dresses out of these babies!! Say hello to our little friend….ok actually they weren’t that little. And they were a little intimidating! My birthday was this week. 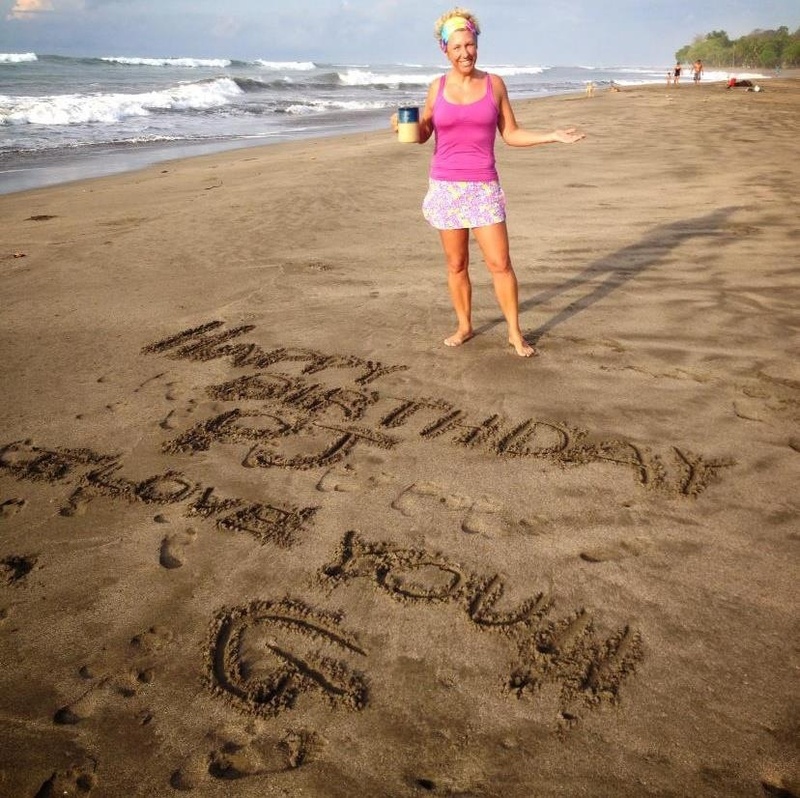 How lucky are G-man and I that we BOTH got to spend our birthdays in paradise? Not a bad way to do it, that’s for sure! However we are looking forward to celebrating with friends when we return home! Not a bad way to wake up on your birthday. Gracias mi amor. Te hacen la vida maravillosa!! Here we are after week one in our home away from home. Esterillos Oeste is just as magnificent as always. Flying in last Monday we had a later arrival flight. We opted to stay our first night in San Jose rather that driving over to the Pacific in the dark. We had already decided that we would take the “old highway” over to the coast the next morning. One of these times, we will brave the drive over at night. We are getting there. And you would think after all of these years here, we would. Especially now with the new highway finished. But for this time….we waited until the next morning. When arriving at the airport, we headed right through customs and immigration quickly. We didn’t have checked bags, so this always goes fast for us. I had made the taxi reservations from the States and quickly realized that I gave them a time for pick-up an hour too late. Coming out of the airport there are always several shuttles and taxis waiting. Someone approached us about calling for our ride. I just have to laugh at my sweet hubs. He speaks not a lick of Spanish, so all of our conversations with people go like this…. They look and speak to him, and he stops and looks at me. I had my contact info for the hotel, but they were having a hard time contacting them. Shortly thereafter, I heard someone calling my name and asking about a ride to our hotel. It was an older gentleman (all in Spanish) I scooped up my bags and my family and jumped into a waiting van. The look on Greg’s face was priceless. Glad he trusts me while traveling in a foreign country to make sound decisions. We got checked into our hotel, and immediately changed into some shorts, tank tops and flip flops (muy caliente aqui) and went down for our first meal. After traveling all day we were tired and ready for some good food, sleep and a nice, cold, cerveza. We had a sweet little waitress who taught me a new Spanish word “Disculpe” after she asked me some English. She complimented me on my “hat” (the cute little fedora I was wearing) she asked if she says “hat” correctly and then asked me what was the difference between “hat and hot” in the English language. She explained in Espanol to me that she could not hear the difference. It was fun to work with her on pronouncing it differently. Although, her way of saying it sounded a bit “southern” kind of with a drawl. I always wonder how we sound to others. Our accent. Obviously when I say “hat and hot” it sounds similar but “hot” sounds like I have an amazing southern twang to muh voice. I have yet to figure out the word I was asking about….”Excuse me” As in getting our waitress’ attention. With the various translations of words she explained “excuse me” (disculpe) but that meaning is as if I didn’t hear what she said, and needed to say, “excuse me or pardon me” Anyone know this?? Our rental auto was coming in the morning at 9am. We thought we would have time to get up, have some breaky and a swim. 7am our phone rang and our car was there. Diego, who is our car contact was early. This was our first lesson of peeling off our “American rush”. (This takes us a couple of days once we arrive) Of course, we quickly got dressed, packed our things into our bags in a hurried and rushed fashion and headed down to the front desk. Knowing this is not typical, but still having a hard time in making someone wait. We got down to the front desk 15 minutes later and the man at the front desk pointed us in the directness of Diego who was lounged on one of the couches in the lobby. The man at the front desk asked if we had enjoyed our morning and some breakfast. We told him Diego was early and we did not want to keep him waiting. He laughed! And let us know what we already knew….Diego would not have minded waiting for us, even if we would’ve had breakfast. He said, that’s not typico here. I laughed and said, “you know us Americans, always rushed and in a hurry” as I said this I snapped my fingers. We both had a good laugh!!! We decided that we were going to skip driving the old highway and take the new. We have used it coming FROM the coast into SJ but never the other way around. 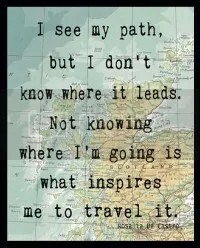 Could we even find our way? We took a chance and figured it out pretty easily. We are always up for the adventure anyways. And for some reason here, it always seems to find us, one way or another. We were on our way. As always we made our stop in Jaco for groceries at the Maxi and took the drive through Jaco to take in the smell of Costa Rica. The heat, the sand, the ocean. Relax. We finally made it to Esterillos Oeste and settled in. This was a busy week on the Pacific because of Semana Santa. Our quiet little village was teeming with Tico’s from all over enjoying their week off with their families. There were tents, tarps, campers, and people all over the beach. Bonfires and picnics and parties. Kids, dogs and dancing. It is so fun to see the families enjoying one another. Greg has never been to EO during Semana Santa (only our kids and i have witnessed this celebration) and he was AMAZED by the amount of people that flood the village. We took this time to acclimate to the climate and get our “chill” on. We just hung out in the village and puttered around the beach and relaxed. We surfed one day, but with the crowds it’s a little harder. We have been beach running every morning, trying to get out as early as possible. The heat and humidity are stifling, and to run in it is tortuous. One morning I went out late (around 6:50am 5:50PST) the humidity was intense and the sun already too high in the sky. I thought I was going to ignite into flames. It was all I could do to manage 4 miles before just diving into the ocean. Yesterday was Easter and the first time we were not celebrating with our family back home. That was a little hard. Missing our big kids. We went to service at the Pura Vida church and felt so welcomed and so blessed to be able to attend and worship God in this setting. The service was bilingual, but there was something about standing in this little church service, where we only knew a few people, and singing worship in Espanol. It was moving and God’s presence was heavy. I followed the whole service with my Spanish Bible (reading in the books of Efesios, Juan y Mateo) and was moved to tears a couple of times. What a celebration! This week as things return to normal here, we will be out exploring some new things. 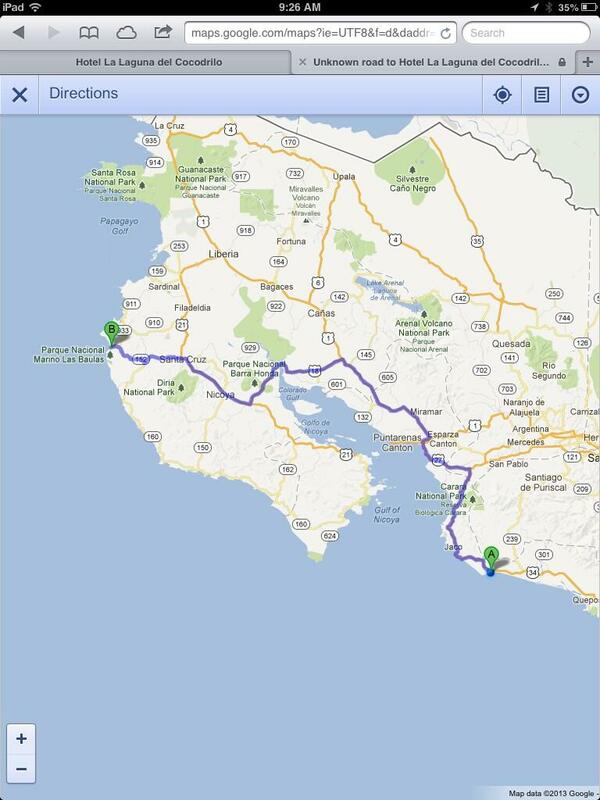 Possibly heading to Panama or North to La Fortuna to Rio Celeste. We will see where the ocean breeze blows us. My morning run and prayer time.